It turns out that some of the major architects behind the media & publicity for the “Leave” campaign in the UK were none other than Washington D.C. PR firm Goddard Gunster, who were credited for huge social media visibility, among other things. An estimated 69.8 million Americans will be using ad blockers by the end of 2016, more than 25% of US internet users. 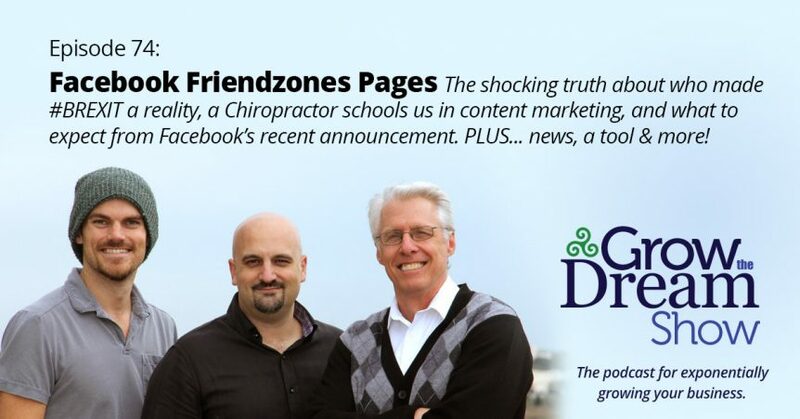 Is this local chiropractor better at content marketing (offline) than most digital marketers and entrepreneurs? We discuss his fantastic method for reaching a highly targeted audience of potential patients, and break down why it works so you can steal, adapt, and otherwise use his ideas. A few weeks ago, Facebook made a big announcement about what will be happening shortly with the organic reach of Facebook Pages. The change no doubt comes as a result of Facebook’s efforts to try to reverse the decline in personal sharing and continue to keep its users as engaged as possible. The bottom line: the organic reach of posts from your Facebook Page will likely be trivial unless those posts are shared. The New York Times take on the same announcement? You won’t see much “news” in your news feed. Aside: Radiolab episode, The Trust Engineers, examines the work of and goes behind the scenes with some of Facebook’s data scientists. Even though he wasn’t with us this week, Josh provided us a great tool of the week: The Effin Amazing UTM Builder. This is an extension for Google Chrome that makes creating UTM links much easier. This will help with your content sharing efforts, tracking various advertising, email and other campaigns. It’s super easy to use, remembers “presets” to help make this faster, and automatically creates bit.ly links for your new URLs.